New batteries from the store sometimes, too, require recharging. They, of course, charged. But if the battery is stood on a shelf or in the storerooms of the store for a long time, he had already lost the necessary capacity. Be sure to see the release date, the date when the battery was charged. Although the warranty period of operation of the battery is calculated from the date of sale, remember that for a period of over 6 months without the battery loses unconditionally given capacity. Try to buy the fresher battery. Feel free to check the integrity of the case, removing, if necessary, to prevent labels in suspicious places. If still left so that you are the owner of "run down" the battery, it is necessary to charge to the optimum values. Thus you will prolong the lifetime of the battery. Charging a new battery, in essence, not different from the usual. Not produce only a forced (accelerated) charging a new battery. This inevitably shortens the life of any battery. Connect the battery to the charger DC in the right polarity. If the battery discharge from service, remove the tube cans. 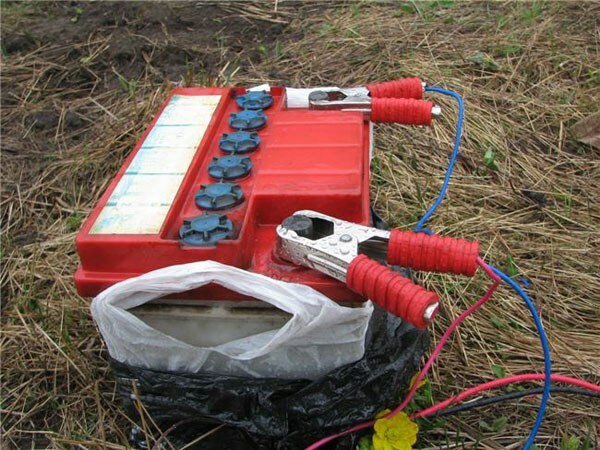 For acid battery is supplied to the terminal current should be 0.1 of the nominal capacity. Let's say you have a battery-55 A. Put on the charger, the charging current of 5.5 A and turn on the device. Charging should be under constant supervision. When will the permanent gassing and the voltage on the battery reaches the value 14.4 V, reduce the charge current up to 1.75 A. In the case of a new rich gas emission, decrease the current another two times. When the voltage on the battery reaches the value of 16.3 - 16.4, complete the procedure. And if current and voltage are kept at a constant level for an hour or two, your battery is fully charged. Do not charge in a residential area. Gases represent a serious health hazard. Moreover, harmful substances are not removed by simple ventilation. They settle on various surfaces and remain in the room, continuing its harmful effects on the human body.